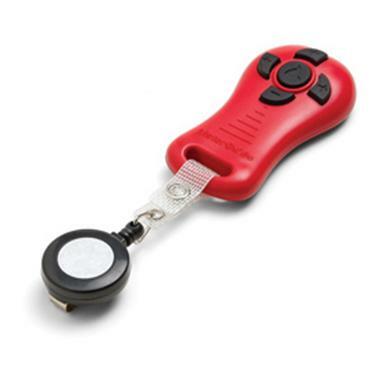 MotorGuide® Handheld Wireless Remote gives you easy control of your motor. Keep your hands free for fishing. This MotorGuide® Handheld Wireless Remote is designed for use with all MotorGuide wireless trolling motors. It gives you ultra-precise command of your digital wireless motor from anywhere on deck. A retractable belt clip keeps it handy and prevents it from falling overboard. You can use up to 4 remotes including the foot pedal that is standard with the Wireless Series trolling motors. Weighs 4 ozs. Make your fishing more convenient! Order ONLINE Today! MotorGuide Handheld Wireless Remote is rated 4.8 out of 5 by 6. Rated 5 out of 5 by Barney from Great Price and Works Great Does everything its supposed to do and controls good. Rated 5 out of 5 by MARVIN from I bought this for my fishing buddy in the bow of the boat; I use the wireless foot pedal. Now we both have control when the other is preoccupied. Both the handheld and the foot control units work great together and make a fishing trip more of a team sport and a joy. Rated 4 out of 5 by STEVEN D. from Be aware that there is a slight time delay from the time you press a button until the trolling motor responds. Not a big issue once you account for it. Works better than the wireless foot operated remote. Rated 5 out of 5 by EFREN from I've been looking hi and low for one of these handheld remotes for my MotorGuide trolling motor but i was not going to spend $50 and up and I've looked all over for the cheapest prices including Epay.com some of those people were charging $15 over the normal price ??? Sportmans guide has the cheapest price for this unit around and your Buyers Club membership makes it even cheaper. Way to go Sportsman Guide and keep bringing me the low prices and i'll be back. Rated 5 out of 5 by STACY from workes fine. Rated 5 out of 5 by RONALD J from I used it last weekend & it worked flawlessly.